Remove the lining from the bottom side of the ribs. Combine the minced garlic, salt, pepper, garlic powder, onion powder and cayenne pepper in a small dish. Stir to mix all of the seasonings together. 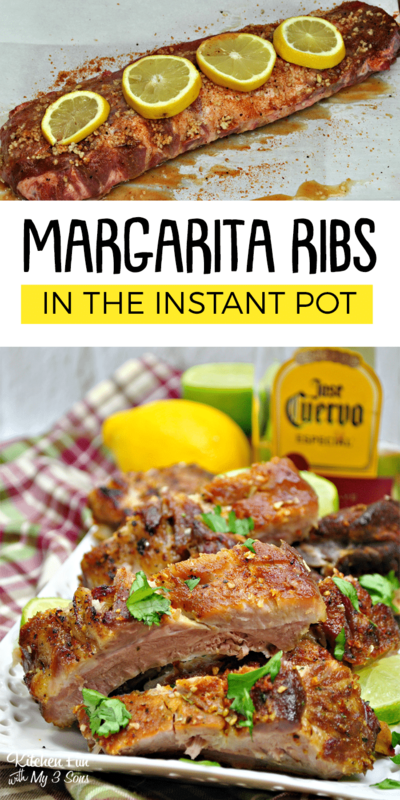 Add your lemon juice and tequila all over the ribs. Cover ribs with foil and allow to marinate for 3-4 hours. Put the metal rack in your pressure cooker. Carefully place your seasoned ribs inside the pot. Stand the ribs on their side. Next carefully pour in the chicken broth. Secure the lid, ensure the vent is closed. Press the Meat button, setting for 25 minutes. Allowing the pressure to naturally release for 10 minutes. Next quick release the all of the way. Carefully remove the ribs from the pressure cooker. Transfer the ribs to a parchment lined baking sheet.